And so the plot thickens. Previously on the p-ch.jp website, the site barely told us anything, and only alluded to it being Persona related when checking the html sheet under page source. With 5 days left to go before the date shown, the site has been updated with Persona 4′s beary own Teddie (I had to do it). 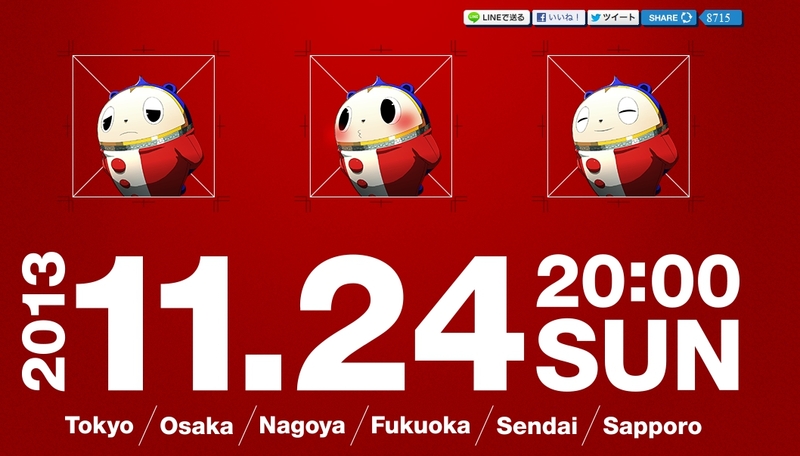 Clicking on the boxes each reveals a different facial expression of Teddie. It you get each box to show the same expression, each box will shake and randomly show a different expression. Before this update, these boxes showed nothing and only vibrated. What about the cities at the bottom? Well nothing’s changed down there, and they all still vibrate. but Teddie’s addition to the site brings this even closer to definitely being Persona related, specifically Persona 4. But is this truly about just Persona 4? This is Atlus we’re talking about, and they like to fake people out sometimes. 5 Days left. What will come next to this site as Sunday nears? This entry was posted in General Articles and tagged Atlus, megaten, persona, Persona 4, shin megami tensei, teddie on November 19, 2013 by Steven T..